The technology and design worlds have been all aflutter about TED since its inception in 1984, but in the last few years, it has grown exponentially, both in awareness and in thought leadership. The platform is anchored in the main events, TEDGlobal in Edinburgh every summer, and TED in Long Beach and TEDActive in Palm Springs, CA, in February. As media attention for the events has grown, so has brand interest, but TED doesn’t make it easy. The organizers are über sensitive to the interests of attendees, so they keep sponsors away from overt marketing in order to insulate the TED-goers from sales-y pitches that might taint the experience for them. EM sent Ken Briodagh to TEDActive this February to get a sense of how brands like American Express, AT&T, Lincoln, Google and Walmart get in front of this group of smart, affluent and trend-setting consumers, without crossing the line. 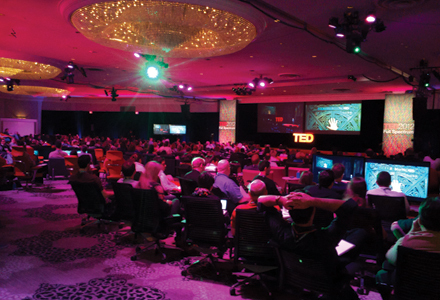 The TEDActive event in California is interesting in that it shares content on two campuses simultaneously. The biggest speakers and keynotes are live in Long Beach, and then simulcast to several theaters and seating zones in Palm Springs, while Palm Springs also has unique live content for the more than 600 attendees from 53 different countries who attend there. Each day is filled with the 18-minute TEDTalks, either live or virtual, and the people flock to hear the top minds in many fields speak about the future of technology, engineering and design, and how those fields will make lasting changes in the world. Meanwhile, for the Palm Springs attendees, where EM was embedded, sponsors worked with TED organizers to get creative about how to reach the audience in a meaningful way. The most obvious and first interaction most attendees had with sponsors was through the gift bag. And what a gift bag. Radio Flyer gave attendees a scooter. Roku, the internet television streaming device, gave out a $100 Roku box. Each attendee got a Jawbone Bluetooth headset. 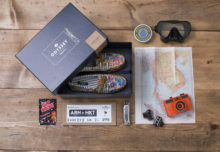 And that’s not to mention the dozens of smaller gifts like the one from shoe maker KEEN, which donated a pair of shoes to someone in need through its HybridLife project in the name of each attendee. 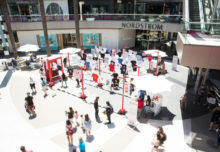 Or help, a nonprofit organization whose mission is to help those in need become and remain self-reliant, which gave each TED-ster a first aid kit that doubled as a bone marrow donor test. Just send in the sample and join the donor registry. Attendees were talking about that one all week. The most immersive brand experiences came through attendee-driven content creation in the form of the TEDActive Projects. They are a key element of the attendee experience at the event, and are designed to allow the TED-sters to dream up, plan and execute six projects covering various hot global issues with a goal of creating a concrete solution. Each project is sponsored by, and aided by a key sponsor. This year, they were: The Health Project, hosted by Pfizer, which set out to answer the question, “How can collective wisdom around health and longevity improve every stage of life?”; the Color Project, hosted by HP, which looked at ways to use color as an effective tool; the Progressive Ideas Project, hosted by Johnnie Walker that looked at ways to bring great ideas into full-scale execution; the Urbanization Project, hosted by Shell and examining how to manage energy consumption in future urban environments; the Community & Commerce Project, hosted by American Express, asking how to keep community values in our networked society; and the Giving Project, hosted by TOMS, which looked for ways to get individuals and businesses more engaged in the act of giving. Each attendee was assigned to one of the projects, but was free to graze and help with them all or switch to one that interested them more. The goal was for the TED community in Palm Springs to come together around the specific topics and ideas and use the ideas and energy of the group to spark initiatives that can take real action. Sponsors provided topic experts to help advise and move teams toward the goals they set together and helped them work together to turn those ideas into action. At the end of the week, each project team presented their findings and plan for further work at a gala banquet. And though they were sponsors, and clearly so, the brands and their representatives were smart enough to become part of the teams, and really chipped in to make each project a success. The one “traditional” activation was situated well away from the main events, and though it was easy to know that Ford sub-brand Lincoln was the creator of the tented design gallery, it was so understated it felt like just another experience. (Are we listening, yet?) It was a clean, white, two-room tent with a “brain bar” full of energy-rich healthy snacks on one side and a design studio on the other. The studio was made up of four sculpting stations, each with tools and a block of modeling clay. A professional sculptor was on hand to help, and guests were free to go ahead and design a car, creating the shape by hand. Talk about a tactile and endemic, but subtle way to get in touch with a brand. For those brands out there looking for a quick lead capture, a mass sampling platform or a fast way to fill a contact database, TEDActive probably isn’t for you. But for those looking for a meaningful way to align their products and services with people who are passionate about sharing new ideas, TEDActive’s tribe might just be the crowd worth sourcing.